Grand Paws Place has been life changing for us as well as Bailey. It’s a perfect place for him to run, play and have fun with other dogs. Taking him there twice a week has made such a difference with his overall behavior. 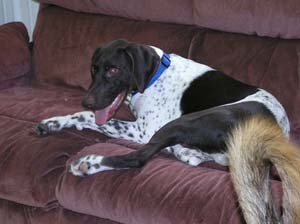 With him being a hunting dog he needs a place to expend his energy and Grand Paws Place is a perfect place for that. Bailey loves going there as he get’s so excited in the car when he realizes where he is going! I love the personalized report cards as well as a few pictures Kristi has given me of what he does during the day. I don’t know what we would do without Grandpas Place!